The arrival a few years ago of the Modeller's Loft/DiD Napoleonic figures opened up a realm of possibilities, but many of the errors of the figures need correcting, and once you start, there is rather a lot of work involved if you want an accurate figure. This was one of my first efforts , and though I might change a few things now, he still looks quite good. 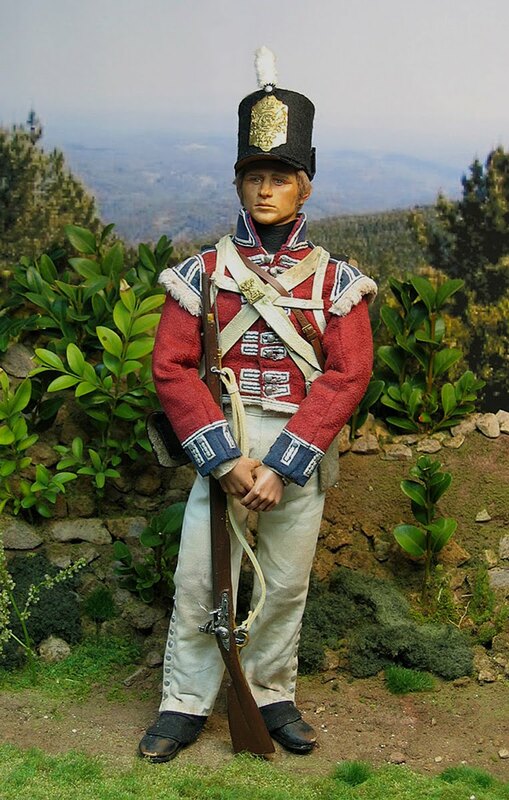 A classic British Infantry soldier from the Peninsular War, posed in a backdrop representing the battlesite. This is made by constructing a foreground scenic base and placing it in front of a photo taken on the actual ridge of Busaco. 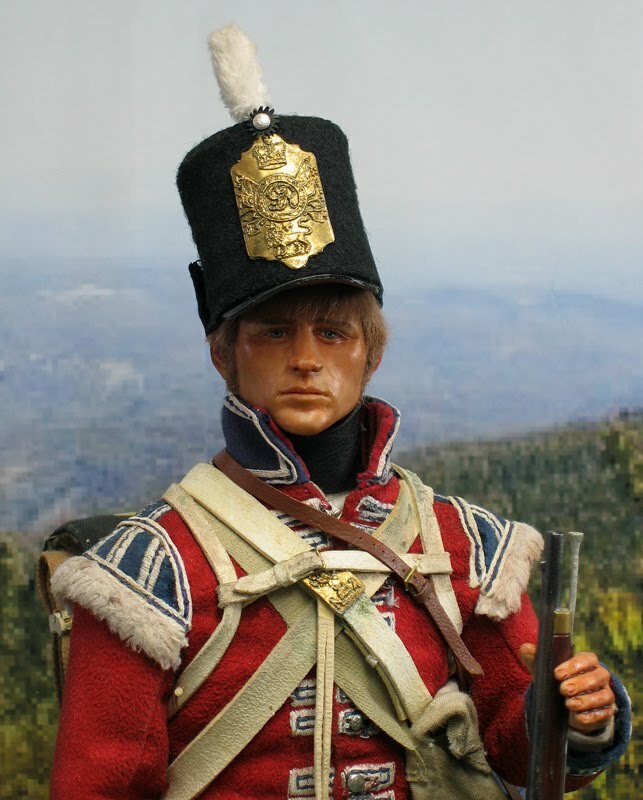 This was the first Napoleonic figure I made, based on the first DiD/ML commercial figure. The basic clothing has been retained, with some improvements, but the shako and equipment have been remade in the proper materials. This a young soldier from the 3rd Battalion , 1st of Foot. They spent most of the day in reserve at Busaco, and were scarcely involved in the battle. 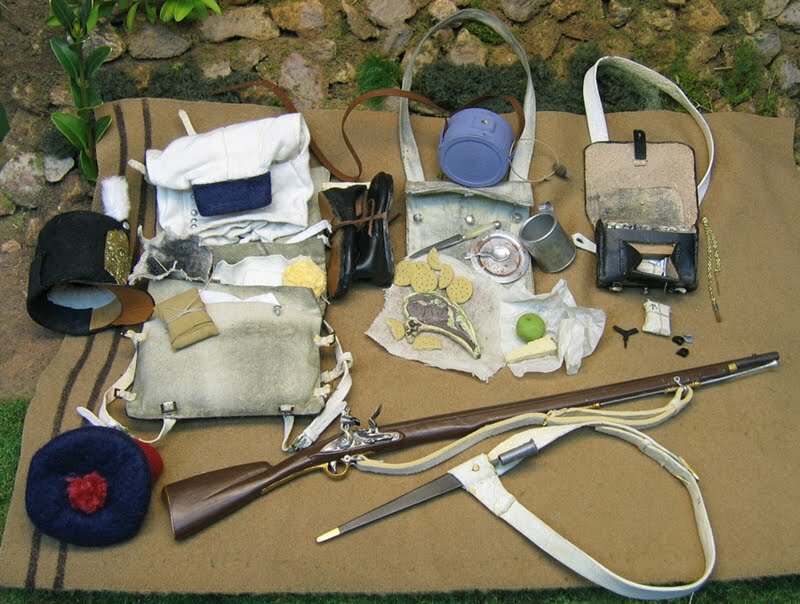 The amount a soldier had to carry was staggering : as well as his musket and the 60 round pouch ( top right ) and bayonet , he has his rations of salt beef and biscuit in the haversack, ( Centre , with the waterbottle ) , and a knapsack of the envelope type containing undress white jacket and forage cap, a spare pair of shoes , shirt & cleaning materials ( left ) . 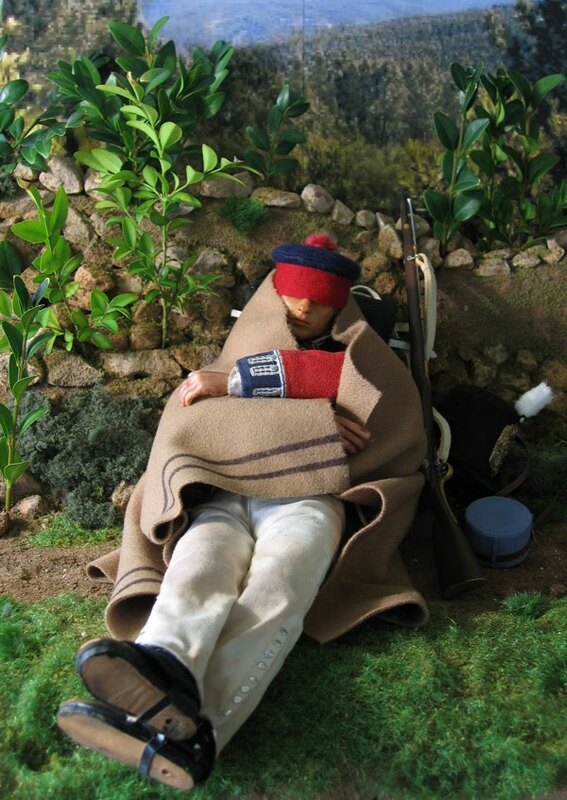 All this is laid out on his blanket .This all actually fits into the model's baggage, and represents a typical load carried by the soldiers in battle and on the march. Here's the rear view : the knapsack , a very simple affair of oil-painted canvas, sags on his back , often resting on the large pouch below.The water barrel was a poor design , and must have bumped about uncomfortably, on top of the greasy haversack supposedly full of rations : soldiers were notorious for eating all their food instead of having to carry it. Since I first made this figure back in 2004, I've revised some of my techniques, and now make all my own hands, since the commercial ones always look unconvincing. I would also now make him a new tunic , so as to get the correct period cut. We also now have better reference material for the equipment , since the publication of Pierre Turner's wonderful book of accurate scaled drawings of all the surviving soldier's kit of this and subsequent periods. He now has a larger haversack , and is due to be issued with a larger pack , and a longer bayonet.... when I get around to it !